Things have changed a lot in a few decades. It's almost impossible to think of a house that doesn't have a dedicated computer room or home office, and the PC center stage within it. And we're not talking just a computer and a monitor anymore -- home rigs can boast hardware configurations that would put NASA to shame. If you love your computer that much, you want to give it an environment in which it can truly shine. Enter the era of the "battlestation," a high-end rig that's given a position of prominence in the home. The 12 techheads in this article have elevated their home offices to temples of technology, and the extent they go to establish PC superiority is truly amazing. The Boston office of Mitch Haile is a great introduction to the world of seriously overpowered home offices. Haile, a software developer, built this workspace in 2011 around a U-shaped desk in the attic of his house, which helped him grind through 60 to 80 hours a week writing code. One side of the desk boasted a quintet of monitors that allow him unprecedented screen space, hooked up to a 12-core Mac Pro with a grotesque 50TB of storage space. This guy's into some serious projects. Unfortunately for fans of epic displays, Haile has cut back on the real estate of his setup and is now rocking a mere three monitors. One class of PC gamers that revels in hardware is flight simulator wonks. Sure, you can replicate the experience of piloting a jet with a keyboard, but it's a lot more fun with a flight stick and all the accoutrements. A Reddit poster with the handle "recoilfx" shared his incredibly stylish battlestation that lets him game to his heart's content and then folds up perfectly into a small table. Dubbed the Flying Coffin, the setup includes a built-in force feedback seat, steering wheel, flight stick and rudder pedals. When it's stowed away, you'd never know it was there. The golden age of home office setups has been in part due to advances in display technology. Just a few decades ago, computer monitors were hefty CRT models that would collapse any wall you mounted them to. With the rise of affordable flat-screen LCDs, workstation designers can now explore panoramas of visual data that boggle the mind. 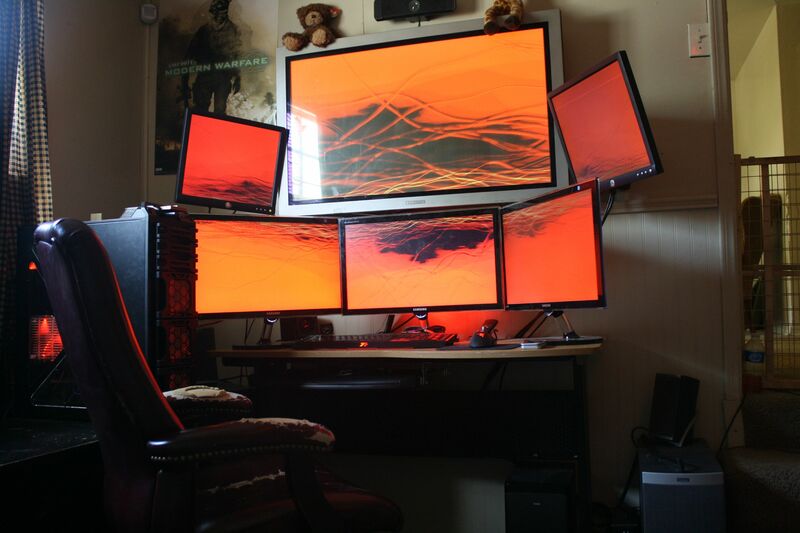 This six-monitor setup with red backlights by Reddit user heartbraden features a large screen for media, a trio at the bottom for graphic design and gaming and two more for monitoring security cameras, weather feeds and other stuff. With 15TB of hard drive space, this puppy's one serious contender. One of the most famous computer mods of all time, the L3P D3SK takes the guts of a high-end computer and transplants them into a liquid-cooled desk that looks like something out of a science-fiction movie. As developed by electrician Peter Brands, the setup is driven by an Intel Core i7 processor with a pair of Nvidia GTX 980 cards and more hardware than you can shake a stick at. The liquid-cooled system is displayed in its full glory in a wall-mounted desk under a translucent top, letting you admire the guts of the system while you're waiting for a YouTube video to buffer. If you want one of your own, Red Harbinger's Cross Desk is a commercial version based on Brands's design. Let's continue with our multi-monitor theme for a little bit with the rig built by Zhek Kromtor for playing EVE Online. The super-complex space game involves keeping track of a huge amount of action at one time, but this setup is over the top. Fifteen monitors laid out in three rows give Kromtor what's called a "multiboxing" setup -- he uses several of his six PCs to operate multiple accounts in the game, employing programs like Synergy to synchronize mouse and PC movements across multiple computers. It's a lot of effort to gather virtual resources in an imaginary world, but EVE players are well-known for their dedication. Reddit's r/battlestations is one of the best places on the web to find inspiration for amazing home office rigs, and one of the most popular posts of all time there shows a PC that thinks outside the box -- literally. Wall mounting your components instead of stuffing them in a casing makes cooling much simpler, and if you've got a sense of style you can do some cool stuff with it. The wall-mounted rig, dubbed "MAXxPlanck2" by Reddit user GoodAtIt, features a water-cooled Intel Core i7 950 processor, a pair of 1TB hard drives and a trio of monitors. It could probably pass as modern art in a very gullible gallery. If you're a software developer, testing across multiple platforms is the bane of your existence. Flickr user coyote.land has constructed a home office rig that takes away a good deal of that aggravation. Boasting five Macs, three PCs and a lonely Linux box, this home office uses a single keyboard and mouse across all the platforms via an open-source hardware-sharing program called Synergy. Most impressively, screen switching from computer to computer is utterly seamless. The guy who owns it does native web app development, meaning that it's actually necessary to have access to all that hardware in one place. Remember those AOL CD-ROMs that kept filling up your mailbox in the '90s? The free-trial discs, which reportedly cost America Online more than $300 million to hand out, were often repurposed as craft material for making shiny mosaics and children's art. Or, for enterprising home stylists like Redditor 88squirlz, as wall and ceiling decor. "More than 50 percent" of the mirrored design is made of AOL trial discs; the rest are "old shareware CDs, printer drivers, old operating systems [and] my Windows 2000 MCSE school CDs." As the CRT monitor and Red Bull cans might suggest, this photo was taken in 2004. But you have to admit: The retro battlestation made you miss your Tamagotchi and car phone.